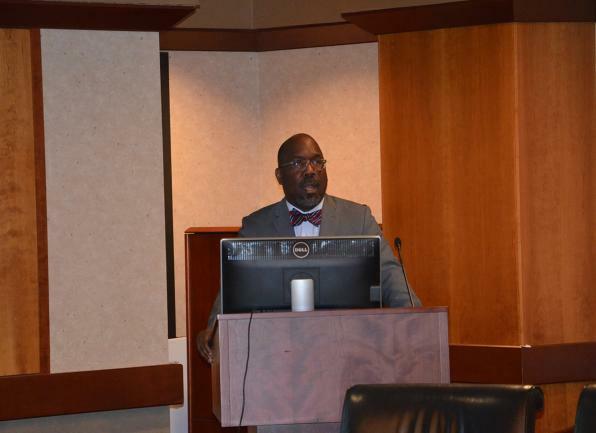 Reginald Tucker-Seeley, ScD, spoke about financial well-being and health at the October 15 meeting of the Georgetown Lombardi Survivorship Research Initiative. (November 2, 2018) — Before researchers consider issues related to financial toxicity and health care, they need to identify the experiences they’re trying to understand and define their terms, said Reginald Tucker-Seeley, ScD, at a meeting co-hosted by Georgetown Lombardi’s Survivorship Research Initiative and the Georgetown University Population Health Scholar Track. Tucker-Seeley, the Edward L. Schneider chair in gerontology and assistant professor of gerontology at the University of Southern California’s Leonard Davis School of Gerontology, gave a talk titled “Conceptualizing and Measuring Financial Well-Being: Implications for Cancer Survivorship” on October 15 in Warwick-Evans. While “financial hardship,” “economic strain,” “financial toxicity,” “financial distress” and “economic insecurity” are a few terms researchers have used to describe challenges that people face related to health and money, some terms are used more frequently than others within a specific context, Tucker-Seeley said. Tucker-Seeley looked at research from psychology, sociology, public health, medicine, consumer science, economics and social work to develop a financial well-being conceptual model and assessment tool for the Money-Health Connections Study, funded by the National Cancer Institute. The survey that Tucker-Seeley developed for the study asked participants questions in three different domains: material, which referred to the resources accessible to the participant; psychosocial, related to how the participant felt about those resources; and behavioral, addressing what the participant did with their resources. After surveying more than 600 people, Tucker-Seeley found that the three domains were statistically correlated but not completely overlapping, suggesting different elements of financial toxicity. Researchers have repeatedly asked Tucker-Seeley to share the measures he used to study financial well-being, which he has done on his lab’s website. Next steps in the research include shortening the survey and evaluating financial toxicity among different populations, including racial and ethnic minorities, as well as low-income adults. Before the Survivorship Research Initiative meeting, Tucker-Seeley spoke with students from the GEMS program about his career path, including his recent experience as a Robert Wood Johnson Foundation Health Policy Fellow. As a first-generation college student, he chose to major in accounting at the University of Tulsa because he knew he’d be able to find a job in the field. Tucker-Seeley earned his master’s degree in human development counseling at Saint Louis University before starting graduate work at the Harvard T.H. Chan School of Public Health, where he earned his doctoral degree in public health. Reflecting upon his experience as a health policy fellow in the office of Democratic Sen. Dianne Feinstein of California, Tucker-Seeley told the students that using consistent terminology helps researchers communicate about the potential policy implications of financial toxicity and health care. However, he learned from his fellowship that policymakers are more likely to express concern about the topic if they have personal experience with it.